I thought I'd give you a short little gem today. Something a little different, but still with that good old food love that you've come to expect. Now hands up who's heard of cheese and wine? 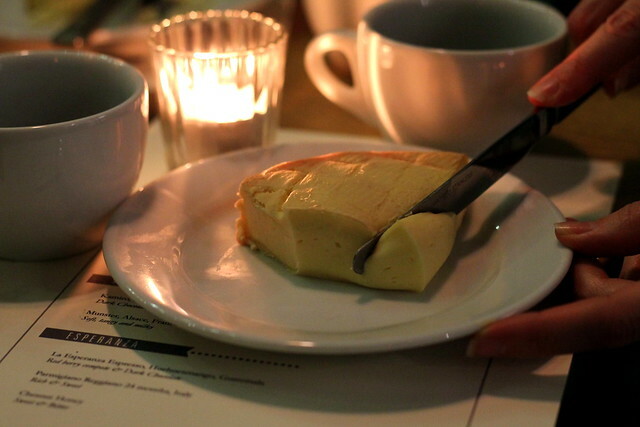 Of course you have, people have whole parties dedicated to the stuff, but cheese and coffee? Not so much. Now hang on, before you go 'eh?' Just read on and give me the benefit of the doubt first. It's pretty darn good and something the Brazilians have been doing forever. And seeing as they produced Gisele, well I think they know what they are talking about when it comes to darn good stuff. 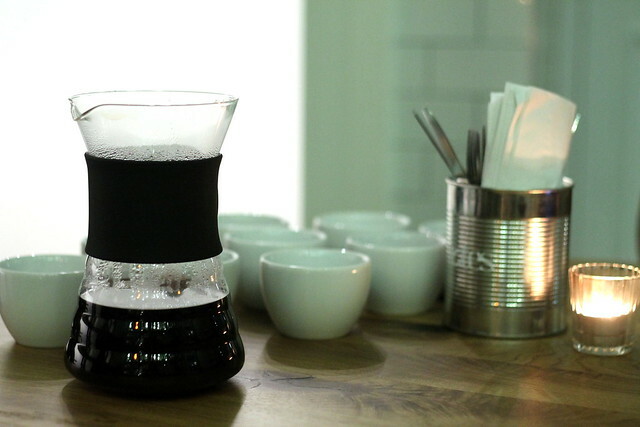 If your a Londoner you may have heard of the very small chain of coffee shops called Notes. It's a bit special as it is also its own roastery, meaning unlike most coffee shops, Notes, grow, roast and then sell their coffee. 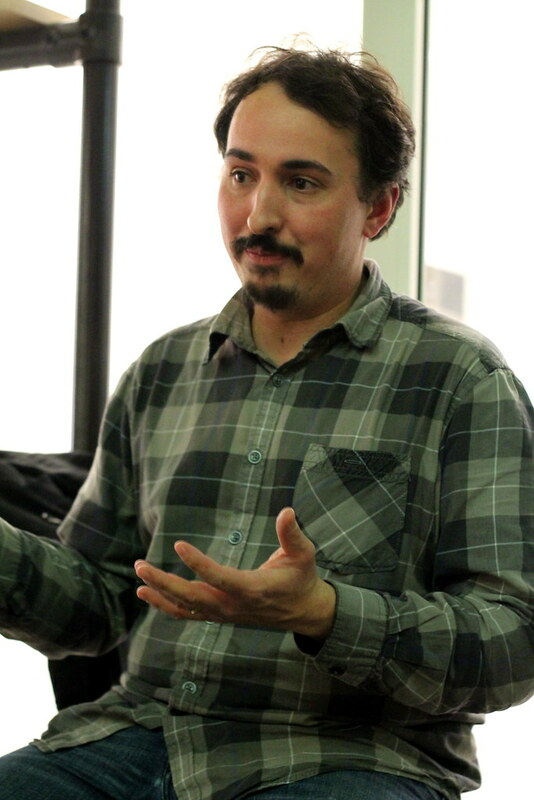 Yes grow even, as Fabio Ferreira, the owner, has a family run coffee plantation in Brazil. 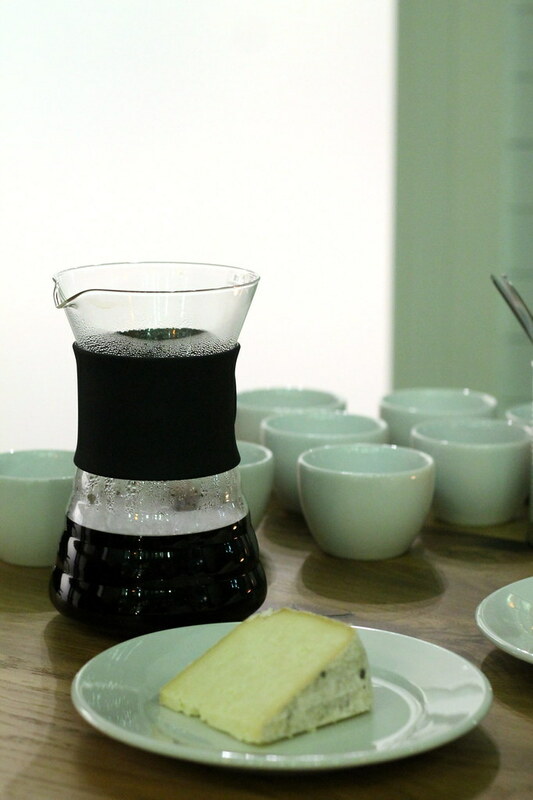 They have just launched a coffee and cheese masterclass where a small group will for about an hour learn, taste and compare cheese and coffee pairings. 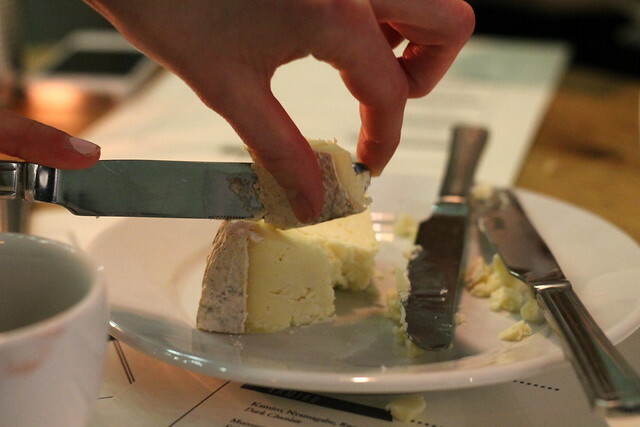 It's all very similar to these wine and cheese tastings, just less boozy. I'm quite a coffee purist, I take it black and I grind and filter my own beans at home, so in the name of research- obviously- I popped down to do some tasting. Now I'm not going to bombard you with information, just enough so you can start pairing right away. Let's go! If you look at your coffee pack, it'll usually give you some description of some kind, a bit like wine no less- "Fruity" or "Tangy" maybe even the words "Hints of caramel". These are the words you need to look out for. 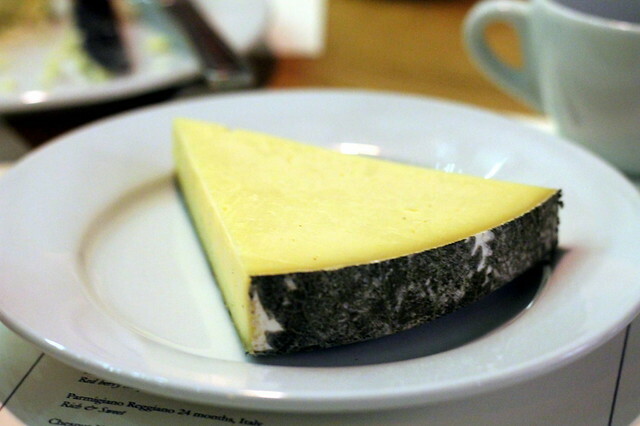 If you love a creamy cheese, then go for a fruity kind of coffee. Look out for words such relating to sweetness and different fruits. Just remember Fruity and creamy. 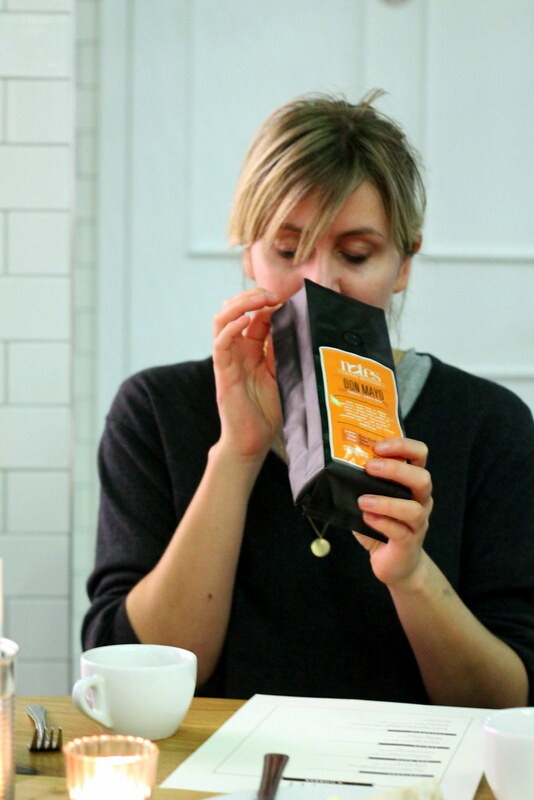 We sipped on Notes Don Mayo coffee from Tarrazu in Costa Rica with a good hunk of Cornish Yarg. And yes, where I'm concerned, it was great big hunks indeed. So Coffee and Cheese eh? Well? It actually works really well. But it is it any wonder, I mean we have a cheese board at the end of a meal and usually a coffee too, so there has to be some logic behind it. Black coffee can be very rich and even a little bitter, so the cheese cuts through this and adds that creaminess that say milk does to a latte. Makes sense. 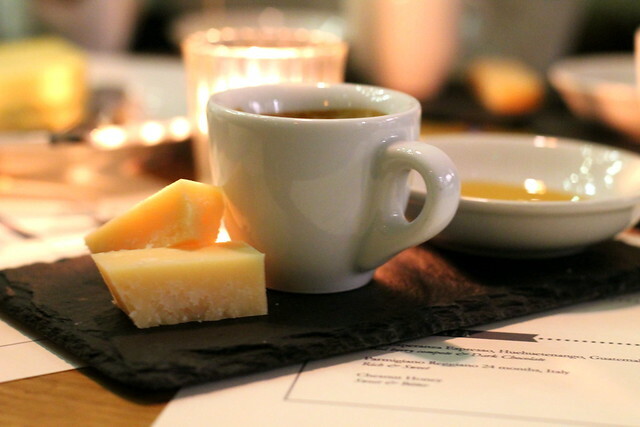 After a while we moved onto the Finca Pantanal Coffee from La Paz in Honduras, paired with a Cotherstone Cheese from Durham. 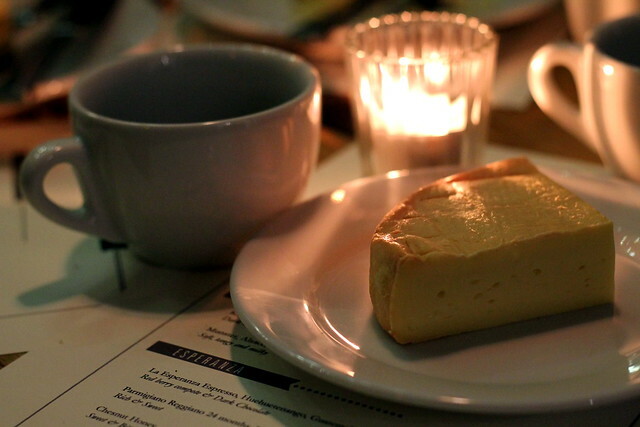 This cheese has a little sourness to it, so goes well with sweet coffees. I'd look out for words like "lemon" too on the coffee pack. Now if you like your cheese a little more, how shall I say this, in your face. Then this next one is for you. 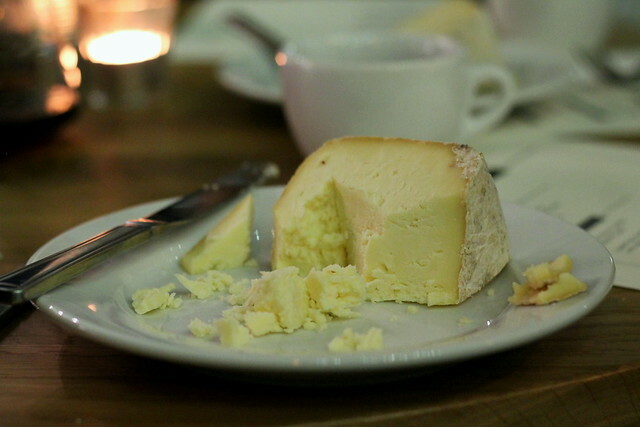 I love my cheese, I really do, but wow was the Alsace Munster cheese tangy. Really packed a punch. For this, you need some thing a little bitter sweet. You know, like high percentage dark chocolate. It's both bitter and sweet. 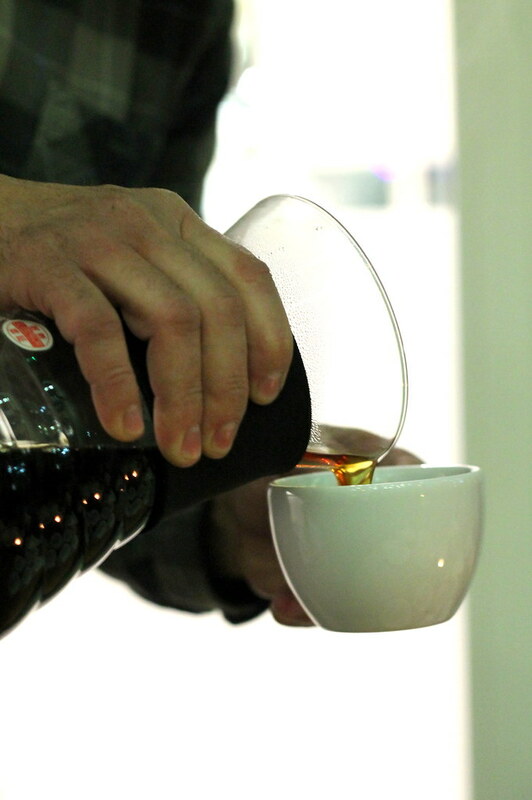 Well, you can get coffee like this too. Note's do a great coffee like this called Kamiro coffee from Nyamagabe in Rwanda, which I now have stocked in my cupboards, as I loved the coffee that much. 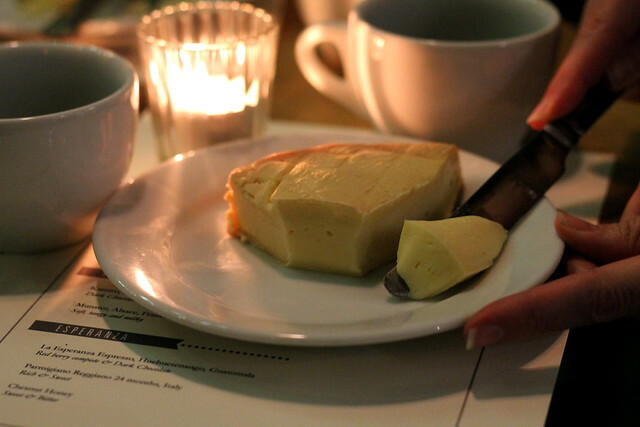 However we all know me love a bit of cheese and wine as a dessert at the end of the night. It gives us that sweetness without so many of the guilty feelings of having a full on pudding. Yes, our brains are weird. However I do think I've got the next big sweet treat for you. It's gooey, its sticky, its sweet as can be, and it will ooze off your fork. 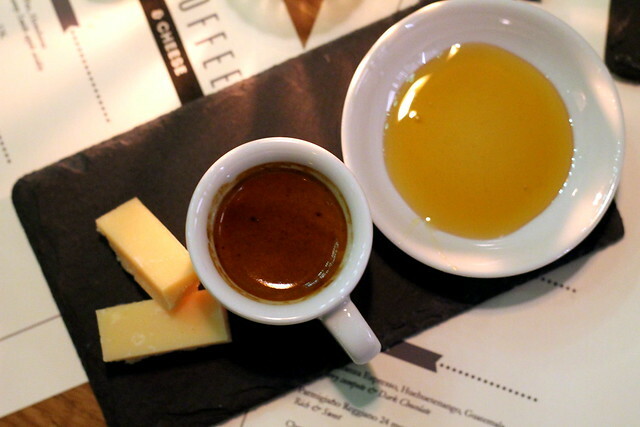 Coffee, Parmesan and HONEY! Oh its good! Tell me that doesn't look good. 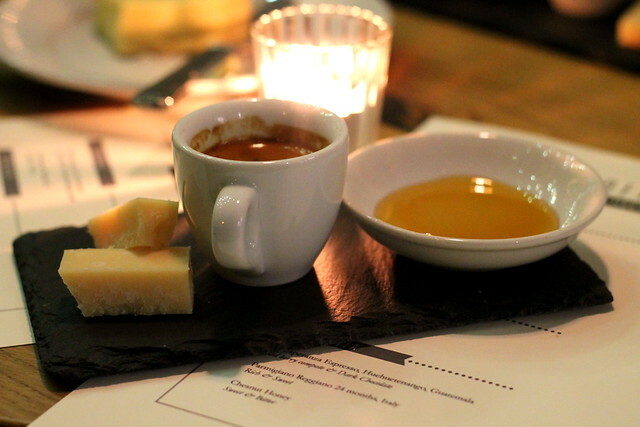 There is something incredible about a strong, hard parmesan and sweet sweet honey. It just works so darn well. For this, have a strong, rich coffee. One that can hold it's own against the sweetness of honey. Try this after dinner one night, trust me, I think you'll be thanking me. Who knew that this odd little combination could be such a skill? Since going to the class I've been nibbling on cheese with my afternoon coffee. 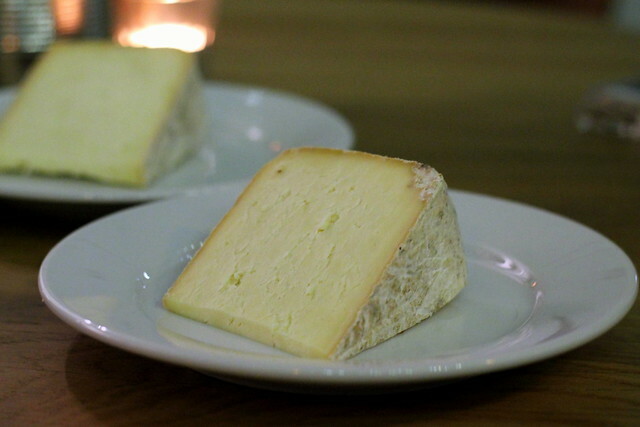 Well any excuse to eat cheese in my opinion and now an excuse to buy fancy cheese! In these cold winter months, I can definitely see myself buy a roaring fire, with a hot cup of Coffee and a plate of cheese. Mmm. 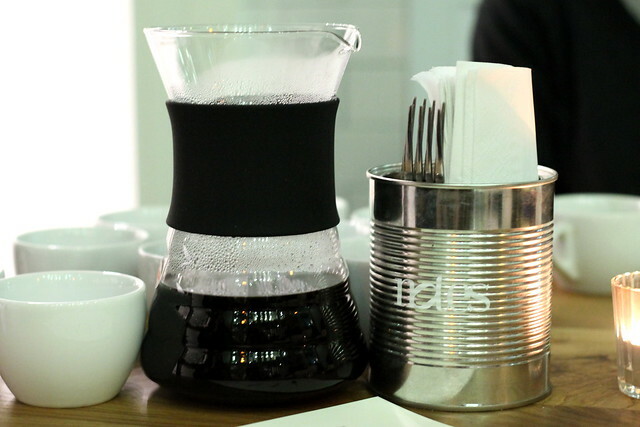 If your still not convinced, get your selves down to a Notes Coffee for a class.